Habit: Shrub, small tree. Stem: bark gray- to red-brown; overwintering buds ovate to lanceolate, +- red to +- purple. Leaf: simple, deciduous; stipules deciduous. Inflorescence: raceme, cluster (panicle), flowers 3--16+; pedicel bractlets generally 1--2. Flower: hypanthium bell- to urn-shaped, bractlets 0; sepals persistent; petals erect to spreading, white (suffused with red); stamens +- 10--20; ovary inferior, 2--5-chambered, styles 2--5. Fruit: pome of 2--5 papery segments, berry-like, generally spheric, generally blue-black. Species In Genus: +- 25 species: temperate North America, Eurasia, northern Africa. Etymology: (Latin: from old French common name) Note: Fruit of some species used by Native Americans for food. Unabridged Note: Variation in Amelanchier in western North America not studied as extensively as in eastern North America, where hybridization, polyploidy, and apomixis have contributed to considerable taxonomic complexity (Campbell & Wright 1996 Folia Geobot Phytotax 31:345--354; http://biology.umaine.edu/Amelanchier). Habit: Plant 0.5--5 m. Stem: twigs glabrous (n DMtns) to generally white-hairy. Leaf: blade 13--45 mm, 10--45 mm wide, generally serrate above middle, abaxially hairy in flower, finely hairy in fruit. Inflorescence: 2--3 cm; flowers 3--6. Flower: petals 6--11 mm; ovary top hairy; styles 2--4(5). Fruit: 6--10 mm diam. Ecology: Open, rocky slopes, canyons, banks of creeks, deserts, conifer forest; Elevation: 200--3400 m. Bioregional Distribution: NW, CaR, SN, CW, SW, MP, SNE, DMtns; Distribution Outside California: to Oregon, Montana, Texas, Baja California. Flowering Time: Apr--Jun Note: Variable; possibly warranting taxonomic status are Amelanchier utahensis var. covillei (Standl.) 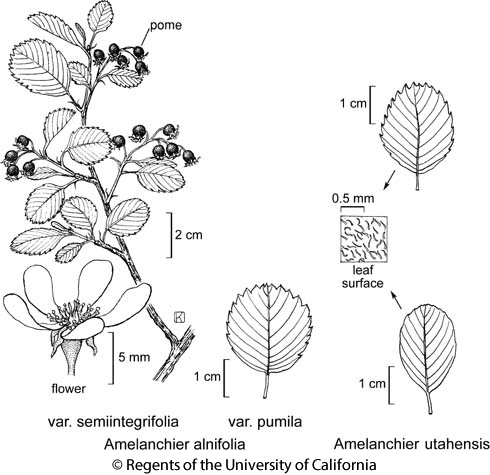 N.H. Holmgren (northern DMtns; generally < 2 m; twigs, leaves glabrous), Amelanchier pallida Greene (petals > 9 mm, leaves with 7--9 pairs of lateral veins); study needed. Citation for this treatment: Christopher S. Campbell 2012, Amelanchier utahensis, in Jepson Flora Project (eds.) Jepson eFlora, http://ucjeps.berkeley.edu/eflora/eflora_display.php?tid=13008, accessed on April 25, 2019. NW, CaR, SN, CW, SW, MP, SNE, DMtns; Markers link to CCH specimen records. Yellow markers indicate records that may provide evidence for eFlora range revision or may have georeferencing or identification issues. Purple markers indicate specimens collected from a garden, greenhouse, or other non-wild location.